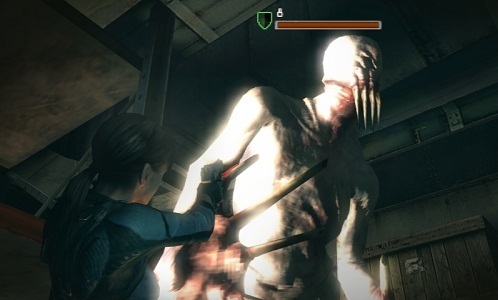 Resident Evil: Revelations' Achievements will provide a total of 1000 GamerScore, just like the previous rereleases of Resident Evil 4 and Resident Evil: Code Veronica. Those two titles received a retail release in Asia but not the US, where they can only be purchased digitally. Revelations could certainly end up following a similar release pattern. Speaking of RE 4 and Code Veronica, many Achievement hunters criticized the two titles for only offering 12 Achievements apiece, a sure sign that they had originally been intended as Xbox Live Arcade games rather than Games on Demand. Revelations, however boasts a full assortment of 50 Achievements. Half of those are devoted to the 2-player co-op Raid Mode. Clearly Capcom wants console players to take full advantage of Raid Mode's many cooperative missions. The Xbox 360 version of Resident Evil: Revelations still hasn't been officially announced, so we don't have a release windows or know whether the co-op will be online only or not just yet. Stay tuned, horror fans! Page created in 0.4069 seconds.